When you move into a new house, you spend a great deal of time focusing on furniture placement, landscaping, and other details that will create the perfect, comfortable home. However, one area often overlooked is window coverings. While it may seem simple to just go to the store to purchase blinds or curtains, you may want to put a bit more thought into it and truly invest in the ambiance of each room. As you browse for ideas, you might be surprised at the cost of certain window treatments. To ensure you are not caught off-guard by the prices, it is important to budget for your purchase. 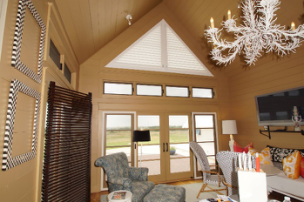 Why are Window Coverings Important? Window coverings are an important feature to your home. They do more than just cover your windows. They play a vital role in your home’s lighting, privacy, and energy efficiency. To ensure they not only look great, but are also functional and cost-effective, you may not want to purchase the cheapest coverings at a big box store or from the internet. 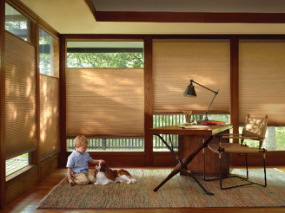 While conventional blinds are affordable, they may not compliment specific rooms or features in your house. To make the right selection for your home, it is important to plan ahead and budget to get exactly what you need. How Do I Budget for Window Coverings? When planning for your window treatments, there are several factors you will need to consider that will influence the cost. Size of Your Openings & Number of Windows: The number of window treatments that will need to be installed will influence the price. To keep the cost within your budget, it is more cost effective to have all your window coverings installed at once than it is to have it done a single unit at a time. Style: The style you choose is among the top determining factor for the cost. On average, off the shelf curtains, drapes, blinds, and shades can be inexpensive, but lack style and fit. Custom made curtains blinds, shades, and shutters are more expensive, but allow you to be more creative and have a better fit. When handled by the correct window covering professional, you get a custom fit and a much better warranty. Shape & Location of Windows: Hard-to-reach windows will cost more than those that are easier to access, such as those that are located above front doors. In addition, windows with a unique shape, like arches, can only be properly covered by specific window coverings. Accessories: Depending on the type of coverings you choose, there may be accessories that are needed, such as valances, curtain rods, and tiebacks. You will need to factor them into the price as well when determining the type and style of window treatments you will use. How Can I Find Affordable Window Coverings? Although you may be tempted to purchase the cheapest coverings, they may not meet your expectations and often come with a very limited warranty or none at all. So, where you may have saved a little money, you may not end up with the results you want. While the cost is often a determining factor, do not focus solely on the price tag. Shop around for durable coverings that will give you the style, fit and function you need. At Southern Shutters Shades, and Blinds, we work hard to provide you with the interior and exterior window covering solutions you need while staying in your budget. Should you pick off the shelf window coverings that save you a little time and money and they fail, you are left on your own, often starting over, and that makes for a costly mistake. Contact our office today to arrange an in-home consultation with a design expert.